JAKARTA, Aug. 24 (Yonhap) — South Korea kept up its winning ways at the 18th Asian Games on Friday with seven gold medals added to its tally. After grabbing 11 gold medals over the first four days of the competition, South Korea has won a dozen over the past two days alone. With 23 gold medals, South Korea still trails Japan by six. China is running away with the top spot once again with 66 gold medals. Cyclist Na Ah-reum made history with her gold medal in the women’s individual time trial. She posted the fastest time in the 18.7-kilometer race at 31:57.10, 0.16 second ahead of Eri Yonamine of Japan. Na won the individual road race on Wednesday, and Friday’s gold made Na the first rider, male or female, to win both the road race and the time trial at the same Asian Games. Na also became South Korea’s second double gold medalist at these Asian Games, joining male sabre fencer Gu Bon-gil. 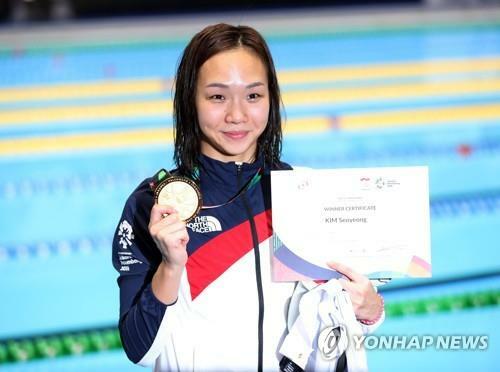 In the swimming pool, Kim Seo-yeong was crowned queen of the women’s 200-meter individual medley, with an Asian Games record time of 2:08.34. This was South Korea’s first Asiad swimming gold medal since 2010 and the first in an individual medley race since 1982. South Korea collected two gold medals in shooting in Palembang, the co-host city with Jakarta. 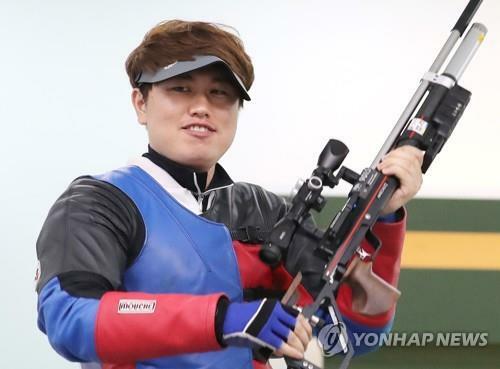 Choi Young-jeon became the inaugural champion of the men’s 300-meter standard rifle event with 569 points, one better than Hussain Ghuwayli Alharbi of Saudi Arabia. Another South Korean, Lee Won-gyu, won bronze with 563 points. Then Jeong You-jin won gold in the men’s 10-meter running target event by beating North Korean Pak Myong-won 6-4 in the one-on-one final. In the running target final, the shooter with the higher score for each target receives a point. The first to reach six points is declared the winner. Jeong built a 5-1 lead before Pak cut the deficit to 5-4. For the 10th shot, Jeong scored 10.0 to Pak’s 9.5 to get his clinching sixth point. Also in shooting, Kim Min-jung won silver in the women’s 10-meter air pistol with 237.6 points, with Wang Qian of China taking the gold with 240.3 points. Kim has now won three medals at this Asiad, having earlier grabbed silver in the 10m air pistol mixed team event and bronze in the women’s 25m pistol. The day’s first gold medal came from rowing, where Park Hyun-su captured the lightweight men’s single sculls title. With a time of 7:12.86, Park was 1.30 seconds ahead of Chiu Hin Chun of Hong Kong to give South Korea its first rowing gold medal at these Asian Games. South Korea also picked up silver in the lightweight men’s double sculls, where Kim Byung-hoon and Lee Min-hyuk finished second to Masayuki Miyaura and Masahiro Takeda of Japan. Also in Palembang, the women’s bowling team delivered gold in the Team of Six event. 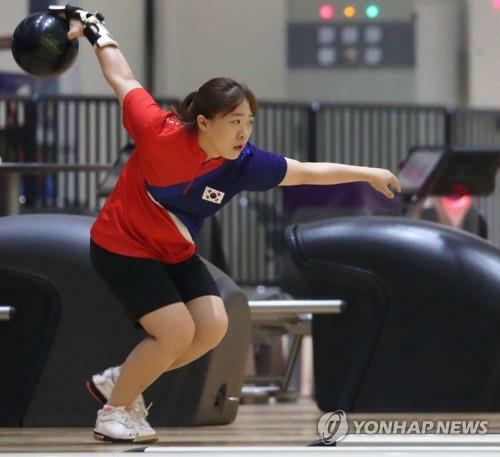 Baek Seung-ja, Han Byul, Kim Hyun-mi, Lee Na-young, Lee Yeon-ji and Ryu Seo-yeon combined for 8,338 points to beat Malaysia by 189 points at Jakabaring Sports City’s Bowling Center in Palembang, co-host city of the Asian Games with Jakarta. The fencing competition ended on Friday with South Korea winning the very last title, the men’s team foil. The quartet of Heo Jun, Son Young-ki, Ha Tae-gyu and Lee Kwang-hyun defeated Hong Kong 45-37 for South Korea’s first Asiad gold in this event since 1994. The women’s epee team settled for silver after losing to China 29-28 in extra time. South Korea’s final fencer, Choi In-jeong, had what appeared to be her winning point wiped out after a video review, as the referee ruled that her knee touched the piste before she got her touch on Sun Yiwen. The men’s vault in artistic gymnastics also ended in controversial circumstances for South Korea. Kim Han-sol won the silver medal with an average score of 14,550 points in two attempts, and he got docked 0.3 point for not bowing to the judges before leaving the stage. Under International Gymnastics Federation rules, a performer needs to show a sign of respect to the officials after completing his performance, and failure to do so can result in a penalty. Kim admitted that he forget to bow to the judges because he was too excited about landing cleanly. South Korea’s appeal was unsuccessful. Also on Friday, South Korea won silver in men’s kabaddi after a 26-16 loss to Iran. In a sport dominated by Iran and India at Asian Games, South Korea improved on the bronze from four years ago. The objective of kabaddi is for a “raider” to penetrate the opposing side of a court and tag out as many of the defenders as possible and then return to his own side — and do so without being tackled by the opponents and in a single breath.